If you haven't heard of the controversy going on with Urban Outfitters then I'll provide a history for you. 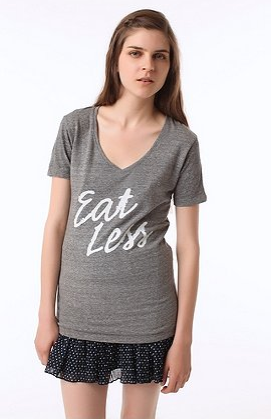 In 2010, UO sold a t-shirt with the words 'Eat Less' embroidered in white on the front. Yes, really! Celebrities like Sophia Bush (of One Tree Hill fame) worked to get the t-shirt taken off the site and succeeded. Weirdly enough, the description on the item actually said "Eat less or more or however much you'd like in this seriously soft knit tee cut long and topped with a v-neck". Now I don't know about you but that sure isn't what the t-shirt is saying to me. 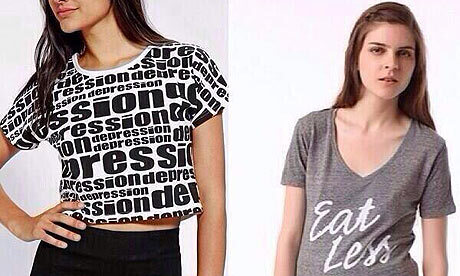 Pair that with the fact the model wearing the t-shirt is clearly very thin and UO have one hefty complaint log. Words fail me at this point but I think you get the gist of it. UO has always stood out as an edgier brand, and it's most certainly standing out right now. On their corporate website they claim to understand and connect with their customers on 'an emotional level'. 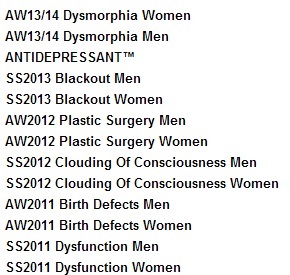 So it's quite interesting that they'd feature t-shirts featured around mental illness on their site. Maybe they didn't think it would be that offensive, although when you look closely into the Depression site their message is clear to see. I don't think the fault is with Depression (the brand) - the creators are obviously trying to be culturally relevant in today's society by using mental illness as their inspiration. UO are responsible and have represented themselves in a destructive manner, especially when you consider their demographic - 18 to 30 years old. They've explained they aren't trying to glamorize mental illness, which may be true but it calls into question the judgement of their buyers. I really do like the clothes in UO and it's really bad to say but I'll probably buy more clothes from them in the future but I hope they don't feature things like this on their website again. This is a little bit different for me - I've wanted to focus on important issues for ages and I thought I'd take the chance. Let me know what you think of this new style of writing, and share your thoughts on the Urban Outfitters' controversy. Quotes and typographic messages tend to be more controversial, especially when it brands like these exist. I guess everything really comes down to the brand image that they wish to construct, and I'm glad that UO made that move. It's important for them to promote positivity and stay positive at all times. Thing is, as long as people buy from them and buy that item then they are still going to sell them. The only way to really show your outrage would be to stop buying from them altogether. But they know they can get away with it because although it might make people annoyed for five minutes, like you said you'll still buy from them. This was a really interesting post and really good to address!